Phase two of the three part project includes the names of Congressional Medal of Honor recipients. 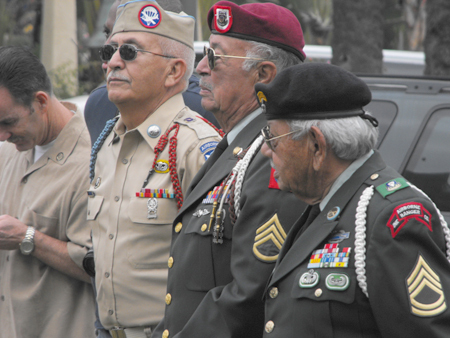 The latest phase of a local monument to honor recipients of the nation’s highest military award was unveiled to the public at El Pueblo Historic Monument in Father Serra Park on Dec 5. The Wall of Honor is a curved monument that bears the emblems of all military services and the names of the 3,446 recipients of the Congressional Medal of Honor, the military’s highest award for valor against enemy action. Members of the Eugene A. Obregon Congressional Medal of Honor Memorial Foundation were joined at the ceremony by various veteran organizations, Los Angeles Mayor Antonio Villaraigosa and City Councilman Jose Huizar (CD-14). The Saturday morning ceremony not only honored all past award recipients, it also served as a call for the unconditional support of all living veterans, regardless of any debate over the merits of the wars in which they fought and survived. EGP Photo by Paul Aranda Jr U.S. Army combat veterans during a public ceremony to unveil a memorial in honor of ‘Medal of Honor’ recipients. The ceremony featured the standard patriotic military traditions of a veteran event, including the presentation of colors, a 21-gun salute and the raising of the prisoner of war and missing in action flags. The ceremony’s emotional high point came as Latino actors Enrique Castillo, Hector Elizondo, Lupe Ontiveros and Jesse Garcia read off various award citations and personal histories of some of the Latino Medal of Honor recipients. In the background, musicians Lorenzo Martinez and Dan Navarro joined Latina vocalist Gabriella Campo in a moving tribute to the veterans. The unveiling of the 30-foot long Wall of Honor completes the second of the three-phase Eugene A. Obregon Congressional Medal Of Honor Memorial project. The final phase of the project will add a 20 foot high monument that will include a 12-foot by 12-foot base with the name of all 42 Latino Medal of Honor recipients. At the top of the base will be a statue of Marine Private First Class Eugene A. Obregon rescuing fellow PFC. Bert Johnson. The total cost of the memorial is $1.2 million. The monument is a decade-long effort led by the foundation president and founder, Bill Lansford and his wife Ruth. Lansford, a World War II and Korean conflict veteran, started the organization with Pete Valdez and Art Flores over a beer at an American Legion bar in 1993 said Lansford at the ceremony. The three men had found out that there existed no public monument to honor the ultimate sacrifices made by Latino service members. They decided to take on the task of creating such a monument, and chose the memory of Eugene A. Obregon, a U.S. Marine from East Los Angeles who fought and died during the Korean conflict, as the symbol of the foundation. Obregon is credited with saving the life of his fellow Marine, Johnson an Anglo from Texas, during an intense firefight in which he would eventually suffer fatal gunshot wounds. Obregon’s efforts allowed nearby Marines to save Johnson from a similar fate. Obregon’s story is featured in the stage play Veteranos – A Legacy of Valor, that tells the stories of four Latino Medal of Honor recipients. Lansford said the purpose of the monument is not to glorify war. “This is not a war monument, it’s a monument of brotherhood,” he said. But even a monument of brotherhood has room for at least one woman. The wall includes the name of Dr. Mary Walker who served as an assistant surgeon for the U.S. Army during the Civil War. She is the only female recipient of the Medal of Honor. Walker, who was a civilian, had her name, along with 911 other recipients officially removed from the award’s honor roll as a result of an award committee review in 1917. President Jimmy Carter, however, placed Walker’s name back on the honor roll in 1977, and she is again recognized as the only female recipient of the award. While Pfc. Obregon is featured prominently on the monument, as are the names of 42 Latinos on the base, Lansford said the monument, including the wall, is about all the recipients, regardless of race. Lansford noted that the wall features the names of the 87 African Americans, 31 Asian Americans and 22 Native Americans who have also earned the prestigious award. The Medal of Honor monument is located at 125 Paseo de la Plaza at El Pueblo de Los Angeles Historical Monument in downtown. The foundation is currently fundraising for the completion of the third phase of the monument. For more information on the monument visit www.obregoncmh.org. December 10, 2009 Copyright © 2012 Eastern Group Publications, Inc.